Boeing today delivered the first 787-9 Dreamliner for Royal Air Maroc, introducing a second member of the super-efficient Dreamliner family to the airline’s fleet. The new airplane offers more seats and more range, which will help Morocco’s flag carrier grow its international business. “We are particularly pleased to receive today our airline’s first 787-9, which will soon be joined by three other models from the same family. The choice of this airplane forms part of our strategy to continuously expand and modernize our fleet, and comes just a few days after the announcement of the invitation made to Royal Air Maroc to join the highly prestigious Oneworld Alliance. This will further strengthen our country’s and Royal Air Maroc’s leadership position on the continent,” says Abdelhamid Addou, CEO and Chairman of Royal Air Maroc. In 2015, the airline was the first in the Mediterranean to fly the 787-8, the initial Dreamliner that offered 20 percent less fuel and fewer emissions. With the airplane’s exceptional fuel efficiency and performance, Royal Air Maroc planned new, non-stop routes such as Casablanca to Washington, D.C and to Miami. To celebrate its inaugural 787-9, Royal Air Maroc unveiled a special livery that honors contemporary Moroccan culture. The airline also debuted a new interior to enhance the flying experience. Passengers in business class will have three seat options, including ‘full flat’ and ‘full privacy’. All travelers will enjoy the Dreamliner’s larger windows, lower cabin altitude, smooth-ride technology, and other amenities. For your new cabin, we wanted a precious and natural color, Amethyst’s color. A stone we can find easily in Morocco. Boeing’s relationship with Morocco goes beyond airplanes and services. The company has supported the development of the kingdom’s aviation industry through partnerships such as a joint venture named MATIS Aerospace that specializes in producing wire bundles and wire harnesses for new airplanes. Boeing is also helping to educate local youth through partnerships with EFE-Morocco and the INJAZ Al-Maghrib association. Top Copyright Photo (all others by the airline): Royal Air Maroc Boeing 787-9 Dreamliner CN-RAM (msn 64625) PAE (Nick Dean). Image: 944636. 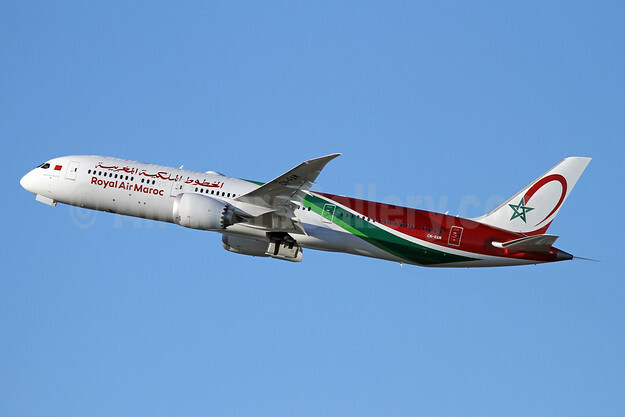 This entry was posted in Royal Air Maroc and tagged Boeing 787-9 Dreamliner, CN-RAM, msn 64625, Royal Air Maroc on December 11, 2018 by Bruce Drum.